In the last decade, Becoming a doctor of alternative medicine has become a popular profession for many Inner Mongolians, Outer Mongolians, and Russian (Buriat) Mongolians. Mongolian students are turning to Mongolian and indigenous healing practices, just as the Western world is currently fascinated by Asian, and often specifically, Tibetan medical and spiritual practices. Westerners are engaged in expanding what is known as New Age spiritualism, which includes the holistic health movement. The concept of Tibetan medicine as a feature of a Tibetan culture can be perceived as a kind of yearning for imagined things that are now being ‘lost’ to modernity. In the same vein, Mongolians, who are again holding fast to their spiritual beliefs and traditional principles, are now able and eager to turn toward Mongolian alternative medical practices as a way to establish a powerful sense of cultural identity. They are not longing for exotic things past, but rather striving to recreate their traditions and wisdom, which was repressed and denied under Russian and Soviet regimes. These medical practices, however, have been preserved in North China, specifically at the Medical College located in Hohhot, Inner Mongolia. Additionally, recently, the Outer Mongolian government has also placed great emphasis on the revival of traditional medicine. Since 1990, the Chinese have tentatively supported some aspects of traditional Mongolian and Tibetan medical practices. These processes do not reject modern biomedicine, introduced during Soviet and Chinese Communist regimes. Instead, Mongolian doctors seek to strengthen indigenous medical systems by combining biomedical and alternative health care. Mongolian medicine has three ancient stages and one modern stage: the ancient nomadic period up to the 13th century; the 13th century through the 16th century; the 16th century to the 20th century; and finally, the modern age of the 21st century. During the first stage, drinking mare’s milk, bone-setting, immersion and covering with skin therapies were developed. The second era, under Genghis Khan, did not yet reflect the influence of the Indo-Tibetan world, although Persian doctors were present in the Great Khan’s empire. Shamanic healing held more influence at this time. The third period, however, reflects the Buddhist and Tibetan influences, which caused a decline of shamanistic healing and a rise in the Indo-Tibetan medical tradition called sowa rigpa. Mongolians became Buddhists and they translated Tibetan texts, including medical texts, assimilating this knowledge into their world view. The fourth stage, or modern stage, of Mongolian medical practices, has resulted in the harmonious integration of modern biomedicine, Chinese medicine and ancient Mongolian medicine. This exchange still continues regarding medical and spiritual practices. Over time, Mongolian medical practitioners have also adopted some Chinese practices, such as acupuncture. Traditional Mongolian medicine is an ancient healing art, influenced by neighboring cultures. For example, due to the close relationship between Mongolians and Tibetans, Mongolian medicine has adopted and integrated Tibetan medical theory and philosophy. Most Mongolian alternative medicine relies on the theory of the Gyushi (the main medical treatise, which dates back to the 12th century AD), as well as some Ayurvedic texts. Today most Mongolian doctors do not memorize these ancient texts but rather strive to understand them conceptually. Doctors also must identify a wide range of medicinal plants, according to their taste and potencies. Today, other aspects of Mongolian medical treatment include: bloodletting, acupuncture, cupping, cauterization, moxibustion, and magnet therapy. Massage, both electrical and by hand, are also practiced as healing arts, and many doctors prescribe (and practice) meditation and yoga. In addition to those stated above, other types of Mongolian folk remedies are utilized by Mongolian alternative doctors. Immersion therapy, for example, includes mineral therapy in the form of medical baths – bathing in natural springs (hot and cold), herbal medicinal baths, and also at times baths employing animal blood, internal organs and hides. (The latter can be used, for bathing, immersing or compressing parts of the body that are ill). Immersion remains one of the five traditional healing types according to Tibetan medicine (bleeding, cauterizing, immersing, compressing, herbal medicines/drinking milk). Another type of Mongolian folk medicine, which derives from shamanic tradition, is termed bone-setting. This practice is well known and respected among the Buriats. The bonesetter uses his or her hands to reset broken bones, while simultaneously spraying alcohol from his/her mouth onto the affected part, which is repaired by placing small splints. Patients are said not to feel pain and to heal quickly. Bonesetters resemble shamanic practitioners (böge or böö and uduγan), as their ability to heal is supernatural and bestowed by their ancestor spirits. Today, bonesetters are still considered a branch of Mongolian medicine; yet most are not educated in other healing arts. Bonesetters, like shamans, trace powers and professions via family lines. In addition to bone-setting, the term andai denotes both mental illness and its treatment. Andai translates as a cultural sign and a kind of dance, said to derive from shamanism. When a person, usually a young woman between 18-25 years of age, has mental problems, shamans would instruct the family and/or community to dance, to heal her illness. Generally, this gender specific issue was concerned with sterility, failed marriages, and/or a bride’s poor adjustment to a new community. This practice is most common among Mongolians in Eastern Inner Mongolia. Mongolian medicines come in the form of pills, powders, and decoctions. They may be called by their Tibetan names, as these recipes came originally from Tibet. In fact, during the 17th century, most Mongolians adopted the Tibetan language as their literary language, as Tibetan monks migrated around Mongolia and other parts of Asia spreading Buddhism. For almost 300 years, Mongolian physicians wrote in Tibetan. Later, these texts were translated into Mongolian and some into Chinese as well. For example, the renowned Inner Mongolian doctor, Jambal Dorjee (18th/19th century) used Tibetan as well Mongolian when writing pharmacology texts. Thus, Mongolian medicine consists of a variety of raw materials: herbs, minerals, and animal products. Seventy percent of these materials grow in Inner Asia, and 30% is imported from India, China, and from the Middle East via Kazakhstan. 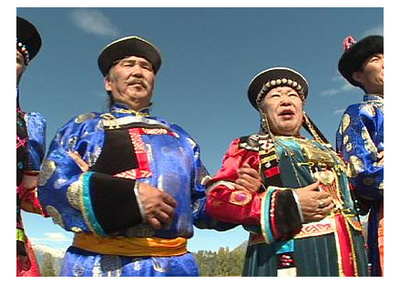 Since the breakup of the USSR in the early 1990s, Mongolian medicine has popularized fasting with mare’s milk (kumis), or water fasting, combined with meditation and living in simple, natural surroundings, sometimes in traditional Mongolian gers. This spa treatment is said to clean out toxins and improve the immune system; I can personally testify that it does indeed have a positive effect. The choice to practice Mongolian medicine, like Tibetan medicine, is symbolic: it not only links the practitioner and his patients to a now legal and popular Buddhist spirituality, but it is also more natural and ancient, linking it to Mongolian/Buriat cultural practices. Mongolian medicine is herbal-based, and has a variety of holistic therapeutic modalities, which make it an indigenous mixture of the pragmatic and the symbolic. It is not surprising to me that this profession, which entailed the migration of young Buriat youth to northern Chinese Mongolia, has become a marker of Buriat identity, as well as a new trend for an alternative healing system that is becoming popular in European Russia and Western Europe.